I walked home from the grocery store today in a whirlwind of snow mixed with ice pellets. Spring is nowhere in sight at the moment. But these look cozy. 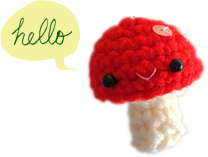 Free crochet puppet scarf pattern by Red Heart Yarn. I didn’t realize that this was supposed to be a tooth pillow. At first glance I thought it was a full‐size pillow that hides money, so that others (or the hider himself, once he’s forgotten about the hiding) would find the money and be pleasantly surprised. I don’t know how I could miss that, when one of the pictures on the post clearly says “feed me teeth,” and instead my mind makes up its own weird stories like that… But anyway, I still think it would look awesome on the couch as a large, cuddly pillow (that hides money, or love notes :D). Instruction on The Long Thread. I would very much like one of these heated cuddle buddies today, with a hot cup of tea. It’s like one of those heat packs filled with grains and herbs, except cuter. Instruction by Eccentricat on Instructables. I recently stumbled upon the idea of plarn (plastic bag yarn) and I’m so intrigued! I’ve crocheted with cut‐up plastic bags before, I made snowflakes with the clear ones in the produce aisle. It tore terribly in the process and I never tried it again. But I saw a better way to make plarn, and I think I may give it a try. We don’t get free plastic bags anymore in Toronto (except those flimsy ones in the produce aisle), they’re 5 cents each, so we try to remember to bring reusable bags when we go shopping. When we do buy plastic bags we reuse the them to line the trash cans. So I actually don’t have a lot of plastic bags lying around in the house, and I’m probably going to try making some small creatures that don’t require a lot of plarn. The Eco Bunny Boy here is both amazing and inspiring. 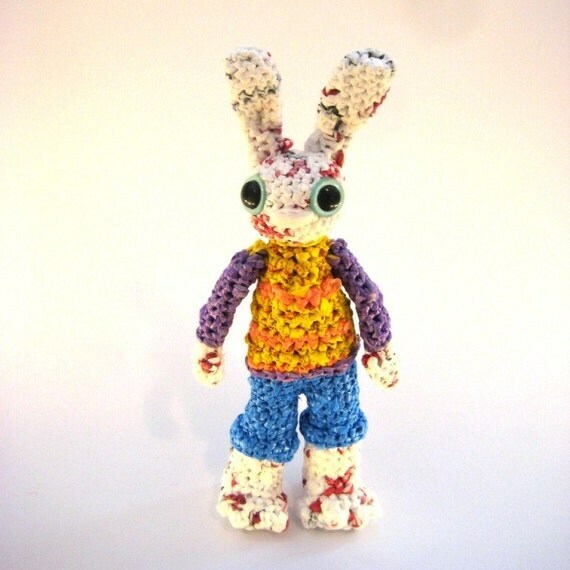 Eco Bunny Boy by outoftheframe on Etsy. 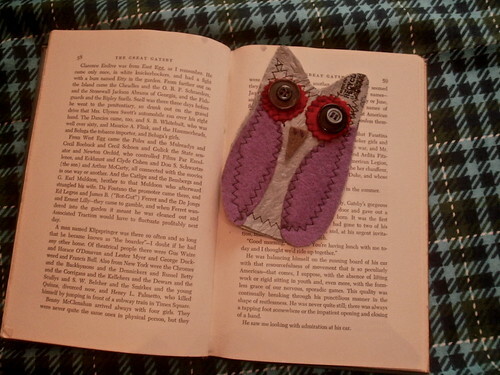 And I love this charming owl bookmark, made with fused plastic bags (how‐to here) and felt. oooh yay! are they all grey though…? i guess i can make a… lone wolf? We get pink and blue ones with our newspaper if you want them.